Following the program WISER staff will be on hand to provide tours and background information of the facility. 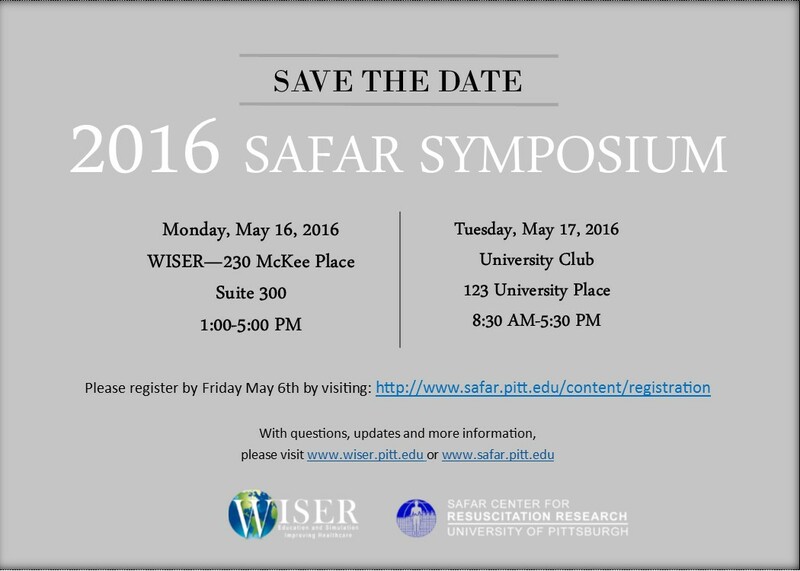 Day two of the 14th Annual Safar Symposium will occur on Tuesday, May 17th beginning at 8:00am at the University Club. This year�s subject is Biomarkers in Resuscitation, Neurocritical Care and Brian Injury. The Peter & Eva Safar lecturer for this year is J. Marc Simard, MD, PhD. His discussion will be �The Sur1-Trmp4 Channel and Brian Edema�. Departmental trainees will also have their abstract posters on display during the symposium. To register for any portion of the 14th Annual Safar Symposium, please go to the following link: http://www.safar.pitt.edu/content/registration. WISER hopes to see you on May 16th!